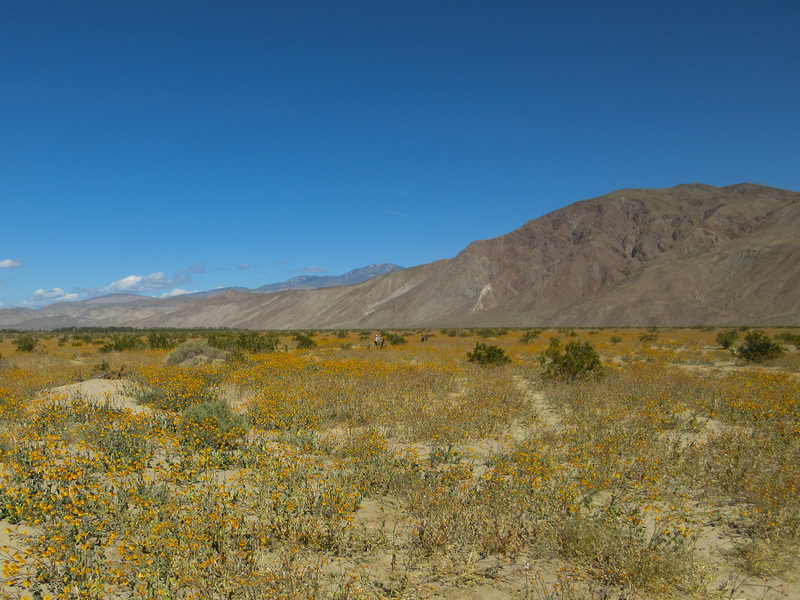 Anza Borrego – Superbloom Hawkwatching. This Saturday I headed for Anza Borrego for Pasadena Audubon’s annual trip to the hawkwatch there. After a very early morning start I arrived in Borrego Springs for our dawn rendezvous. Our first port of call was the Mesquite woods in town which are usually home to Crissal Thrasher and historically it seems now to Lucy’s Warbler. Though we did find some nice desert denizens including Verdin, Black-throated Sparrow and Black-capped Gnatcatcher we struggled to turn up any of the rarer species hoped for here. Still none of the above are very common in LA County so it’s always a treat to see them. The other highlights here were numbers of Western Kingbirds, including groups of migrants passing overhead and a couple of rare Lawrence’s Goldfinch that dropped in next to the group!. Next stop turned from opportune bathroom break into an intensive birding stop. A stop in town lead us to both a nesting Great Horned Owl and from there we started to find a few interesting species dotted around town including a nesting Costa’s Hummingbird, White-winged and Common Ground Dove. The thing I’ve always loved most about birding is migration because you just never know what you are going to find next and as we walked around the block back to our cars from the owl nest we found ourselves a little flock of migrating passerines. In the mix were a decent number of birds and a mix of species including warblers, vireos and orioles. Highlights were almost certainly the stunning male Bullock’s and Hooded Orioles with runner up prizes going to Wilson’s and Nashville Warblers. Unfortunately the predicted winds that were forecast for the afternoon kicked up a little earlier than predicted which made both bird and bloom watching a little harder than anticipated. Still, we managed to find a nice couple of fields of flowers out on Di Giorgio Rd and Henderson Canyon Rd and a nice mix of different species out at Old Spring Rd. Though the winds were roaring luck was on our side and I randomly spotted some Swainson’s Hawks coursing out over a field and the group managed to walk out towards them for better looks. It was nice to be able to show people the differences in plumage between adults and juveniles and compare the different morphs too. 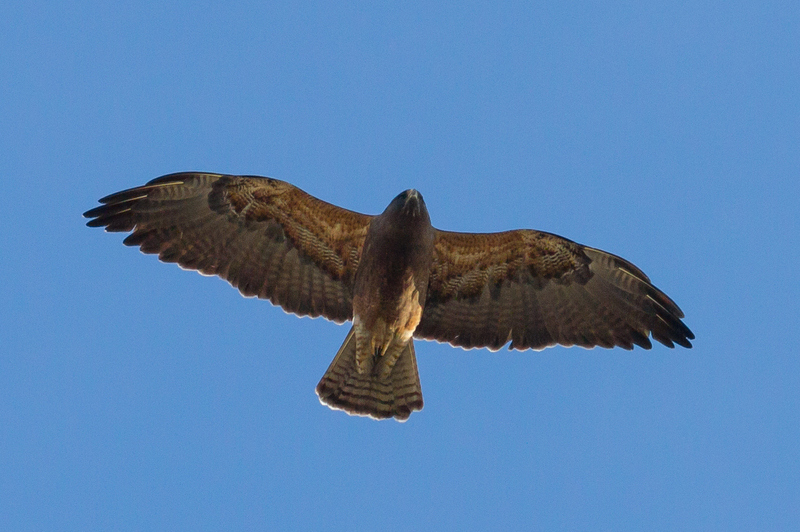 We also pulled out a Red-tailed Hawk from the group as well. Next stop was a quick lunch break over at the Tamarisk Grove campground. 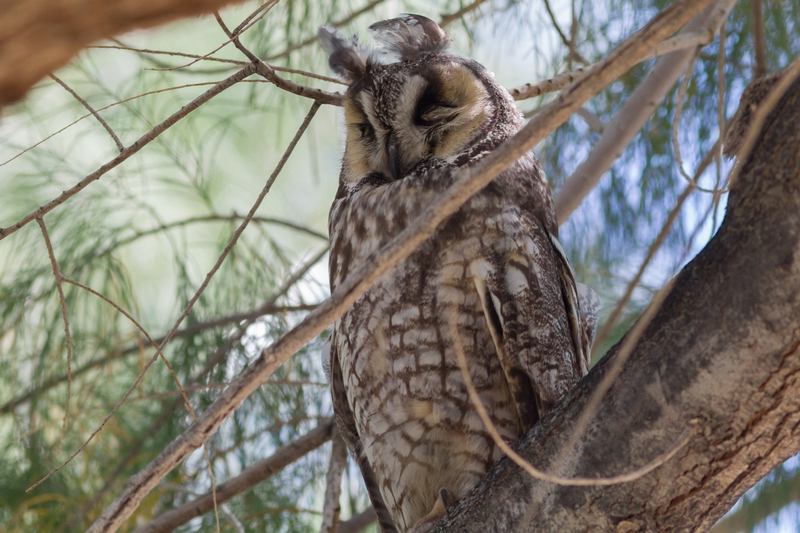 Here among the throngs of campers and visitors enjoying the wildflower and cactus show we managed to stumble upon a beautiful Long-eared Owl. The bird, though not more than a few feet from a busy parking lot, seemed very relaxed apart from when an Anna’s Hummingbird came buzzing around his head at which point he immediately opened his bright yellow eyes and stared angrily at this buzzing interloper. The last portion of our day we hiked out to Yaqui Wells. A mile and a half round trip from Tamarisk Grove campground that takes you through a mix of beautiful cactus dotted habitat before it eventually opens up on this natural seep. This year round water resource attracts all kinds of animals including a mix of birds. The further we got from the campground so it also allowed us to escape a little from the hordes of campers and even better we were also pretty shaded from the howling winds. It was beautiful and quiet here and we eventually started to run into some birds here including locally breeding specialties: Phainopepla, Rock Wren and the incredibly stunning Scott’s Orioles, as well as small mixed flocks that included a nice variety of migrants. As we slowly worked our way along the trail we found groups of early arriving species that included Pacific-slope Flycatcher, Ash-throated Flycatcher, Black-throated Gray, Nashville and Orange-crowned Warblers. 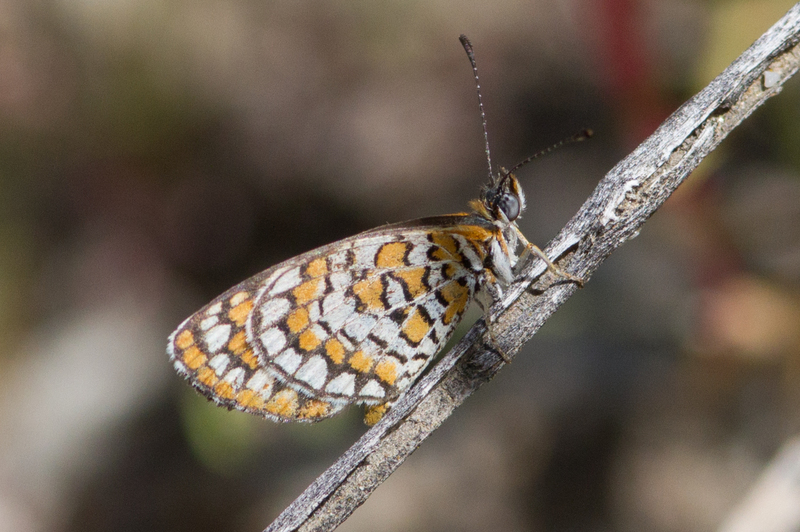 As well as the birds, Yaqui Wells also provided us with a bunch of pretty butterflies among the blooming flowers including Desert Orange Tip, Arizona Powdered-Skipper, Becker’s White, Tiny Checkerspot and sadly, a recently deceased Sleepy Orange. 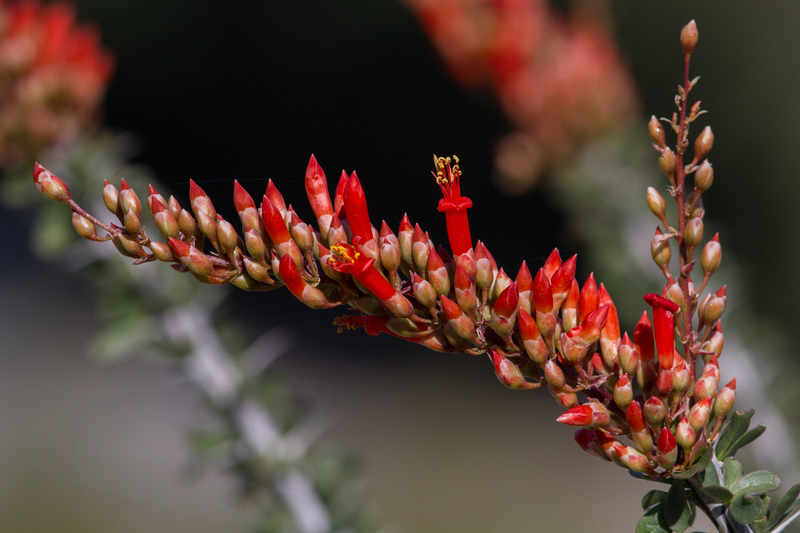 The finale of our trip was highlighted by two beautiful orioles, Hooded and Bullock’s, that we found feeding on a stunning Ocotillo – a real cacophony of color! We ended our day with a respectable 53 species of birds including two species of owl, three species of oriole with Lawrence’s Goldfinch and the Scott’s Orioles probably among the highlights. We also enjoyed the beautiful scenery, this years much lauded superbloom (even if things were a little past peak) and some attractive butterflies. It was sad to have to head home and I can’t wait to do it again next year. Next time I definitely need to make sure I schedule more time in town! Thanks to everyone who came out and made it such a fun day, especially Naresh for his wildflower knowledge and Hilary and Steve for providing our own private bathroom facilities on the day. I have posted a handful of shots from the day on my flickr page (here) and Naresh has kindly shared his photos from the day (here).